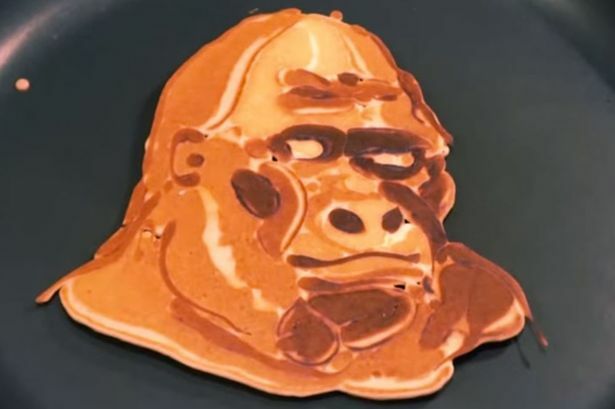 Watch a very talented dad monkey around making chocolate pancakes to look like chimpanzees, orangutans and gorillas! As this incredible video shows, illustrator Nathan Shields' pancake designs are flippin' amazing. For his most recent collection, he's battered the competition, creating monkey versions of the sweet treats inspired by a gorilla pancake attempt by his son. The dad-of-two creates his designs using varying shades of batter, coloured with hot chocolate powder. Squirting the mixture into the pan in stages, the blobs of batter come to life when tossed over revealing life-like faces of apes. From marsupials and musical instruments, to sea life and Star Wars characters, there's not a lot Nathan hasn't attempted to create using his trusty whisk, nonstick pan and spatula. The maths teacher, from Washington, began entertaining his children with silly pancakes while living in Saipan, an island in the Pacific. View more of his creations on his website.